Feminine style and glamour echo the fluid drapery and beading directly from the runway. 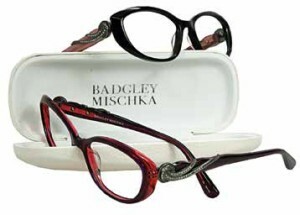 Badgley Mischka’s exquisite attention to detail is directly translated through the latest eyewear, while featuring highest quality products and design elements. Dionne is a sheet titanium construction, semi rimless frame with an uplifted oval eye shape. The finest quality Mazzucchelli block acetates combine at temples to create a gracefully feminine frame. Micro Swarovski crystal are scattered at the temples for a subtle touch of sparkle. Adjustable nose pads allow for a customized fit. Dionne is available in Ebony and Merlot. Veronique offers a streamlined acetate frame with a larger, rounded eye shape. Temples are draped with metal hardware embellished with Swarovski crystals for the ultimate glamorous look. Veronique is available in Cabernet and Ebony. Over the past twenty years, Badgley Mischka has flourished into a true lifestyle brand recognizable worldwide. To date, the Badgley Mischka label includes: Badgley Mischka Couture, Eveningwear, Sportswear, Handbags, Eyewear, Footwear, Jewelry, Watches, Swimwear, Fragrance, Home, Bridal and Bridesmaids. Badgley Mischka is sold in the most prestigious stores in the world including Bergdorf Goodman, Neiman Marcus, Saks Fifth Avenue and Holt Renfrew as well as at Badgley Mischka boutiques in Los Angeles and New York. XOXO June Optical Collection offers a trendy mix of metal and acetate with bold patterns and colors! Divine features a flat metal front, over a polished metal with a soft deep rectangular eye shape. Japanese pearlized acetates are featured on temples and create an edgy watercolor effect. Adjustable nose pads allow for a more comfortable fit. Divine is available in Jet and Teal. Belle is a petite frame that packs a colorful punch! Vibrant turquoise is laminated with a wild tortoise acetate, and a small XOXO metal emblem is featured on the end piece. Belle is also available in a demure jet crystal acetate for a more subtle style. Scandal features a flirty modern cat eye, the best-selling frame shape. Wild HD animal prints are featured on curved temples and wrapped end pieces that complement the acetate frame front. Scandal is available in Jet and Tortoise. Argyleculture’s Optical Collection features bold temples and eye catching acetates to accent your everyday style. Hudson highlights a soft rectangle eye shape with a gradient acetate frame front. End pieces and notched temples feature a custom laminated Mazzucchelli block acetate. Hudson is available in Slate/Blue and Olive/Black. Davis is an updated full metal frame with a best-selling shape. Beveled end pieces and a thicker bridge create a soft rectangle eye shape. Translucent bone acetate temples, adjustable nose pieces and spring hinges create a frame that is just as stylish as it is comfortable. Davis is available in Gunmetal and Black. Argyleculture Eyewear is sold by The McGee Group under the license from Argyleculture. Visit our website, mcgeegroup.com, to view the entire collection. For more information, contact The McGee Group at 800-966-2020 or sales@mcgeegroup.com. The McGee Group markets ophthalmic frames, sunwear, reading glasses and cases to all customer groups throughout North America and many international markets including eye care professionals, distributors, large optical chains, mass merchants, and department stores. Since its inception in 1976, The McGee Group has gained recognition as a forward thinking company by merging innovative technology with fashion, offering high quality products, superior marketing support and value-added customer service. The McGee Group currently manufactures and distributes Badgley Mischka Eyewear and Sunwear, Vera Bradley Eyewear and Sunwear, XOXO Eyewear and Sunwear, Ducks Unlimited Eyewear and Sunwear, Totally Rimless Eyewear, and Argyleculture Eyewear and Sunwear by Russell Simmons.